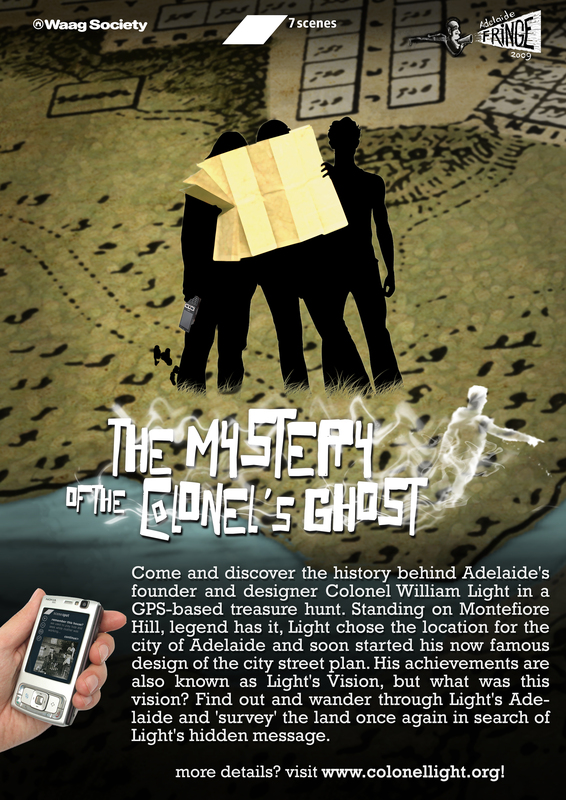 At the 2009 Adelaide Fringe festival the Urban Game “The Mystery of the Colonel’s Ghost” will transform the Adelaide streets into a treasure hunt playground. Players are taken on a journey that transports them back into time when Colonel Light first designed the city of Adelaide. Using GPS-equipped mobile phones and the treasure map you see below they play the game in which they interact with other players, locals and features in the environment, based on your GPS location and slowly but surely see the Colonel’s mystery unfold. For more info on the game rules please check the game section. “The Mystery of the Colonel’s Ghost” is played on march 1st 2009 in three different scheduled session for which you can register. You play the game in a small group of up to four people. Each of the registered groups will get a GPS phone from the Fringe Office at Hindley st 105. We can only cater for six groups per session, but if you have a supported GPS phone you can come and play with others as well. But only if you come prepared! So please follow the installation instructions on the technology page. You will receive a login account at the Fringe Office. Sessions are scheduled at 11:00, 13:30 and 16:00. Please come at the exact time that you have registered for so you don’t miss the game introduction. You can register by calling 81002003 or emailing melanie[at]adelaidefringe[dot]com[dot]au.